The existence of self-titration of nicotine when smoking is pretty well established scientifically. It’s easy enough to get reliable figures by measuring the nicotine level in the blood. But often the established level differs from that measured when the smoker could consume his customary fare. 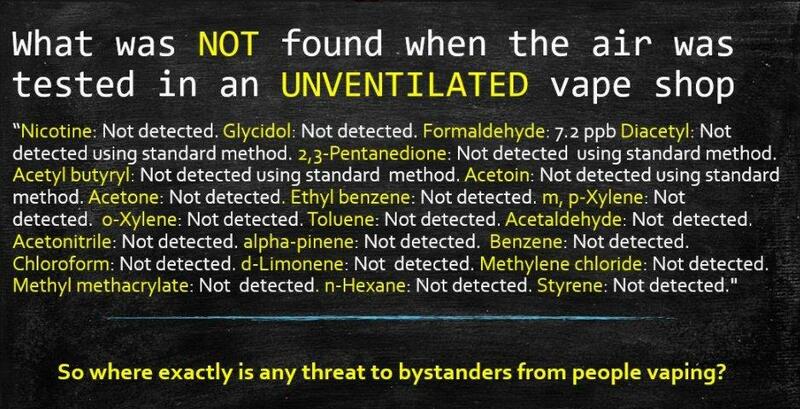 This difference is even more pronounced when testing vapers. On Saturday 20th May the 2014/40/EU Directive known as the Tobacco Products Directive (TPD) celebrates its first anniversary since it came into force in 2016. The European Commission described the TPD a year ago as the tool that “aims to improve the functioning of the internal market for tobacco and related products, while ensuring a high level of health protection for European citizens”. Among 12- to 17-year-olds who have never used tobacco products, nearly half were considered receptive to tobacco marketing if they were able to recall or liked at least one advertisement, report a coalition of behavioral scientists in a new national study. Receptivity to tobacco ads is associated with an increased susceptibility to smoking cigarettes in the future. Scientists from Virginia Commonwealth University (VCU) have released the results of an extensive e-cig study which contradicts previous claims that vaping is a gateway to smoking. Since the very first American settlers established the colony of Jamestown in 1607, tobacco has been a primary crop of the beautiful state of Virginia. Virginia is also one of the very few states in the Union that has virtually no anti-vaping laws on the books, and the seaside town of Virginia Beach is often rated the vape-friendliest city in the United States. “The Tobacco Products Directive (TPD) was debated from a position of ignorance. There is no point to these regulations and no public health benefit. They do, however, destroy a highly successful free market which has seen almost 3 million people make the switch from tobacco to a far safer alternative at no cost to the taxpayer. Make no mistake, the only result of these regulations will be to deter smokers from quitting smoking. Britain’s burgeoning vaping industry is warning of a rise in homemade versions of the liquids used in the devices as new laws governing their strength take effect this weekend. Vape shops warn that the health of consumers will be put at risk because people will end up buying stronger products from the black market or the internet that do not meet safety standards. Another interesting aspect of the global tobacco industry is an asymmetrical distribution of smoking rates, as the World Health Organization (WHO) estimates that 80% of total smokers live in low- to middle-income countries where tobacco consumption is still rising due to lenient anti-smoking regulations. with the laws about e-cigarette products commencing 1 August 2017. It tells you about your responsibilities when selling e-cigarette products in Victoria. This supplement covers the main sale, display and advertising laws that apply to e-cigarette products. You should also read the Tobacco retailer guide. A health expert has come out swinging at tobacco giant Philip Morris, saying the Ministry of Health is right to prosecute the company for thinking it is “above the law”. The ministry yesterday announced it had laid charges against the company in connection with its tobacco sticks known as HEETS. A motion which would effectively scupper the TPD in the UK has been placed by Lord Callanan in the House of Lords. The motion ‘requests’ that the TPD be annulled. The grounds for doing this, the motion states, are because of the fact that restrictions on product choice, and restrictions on advertising were devised before the accumulation of evidence that e-cigarettes were enabling so many people to stop smoking. There’s been a bit of misguided excitement of late about an Early Day Motion on the subject of the negative effect of the Tobacco Products Directive (TPD) on e-cigs. I say misguided because EDMs are the laziest possible thing an MP can do, they mean absolutely nothing and will achieve nothing. I have met MPs who have been unaware that they have even signed them because EDMs are such a low-level priority that they leave it up to their staff to handle; the political equivalent of routine filing. Throughout the TPD ‘war’ and its numerous battles, one message has come through loud and clear from those we have sought to influence and that is that it is the hundreds or thousands of individual stories which have made politicians and regulators listen and in many cases change their minds.